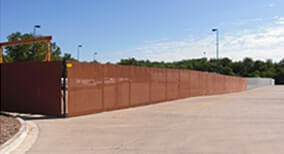 Commercial Privacy Fencing | Contact Hohulin Fence Today! This no-maintenance product comes with a Lifetime Warranty against product failure. Gates are available to match style of fence. Several colors and finish styles are available, such as wood grain. 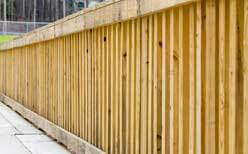 Wood fencing is available in a Pressure Treated Southern Yellow Pine Pickets, Rails, and Posts. Typically, there is no warranty available. 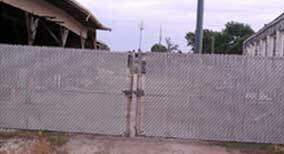 Swing gates are available with a limited opening size. This disease and rot resistant privacy fencing option has an aromatic odor for the first few months. After about 1-2 years the fence will turn silver grey. WRC Fence has no warranty. 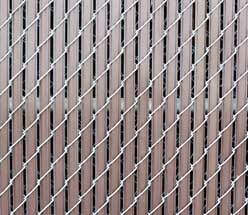 Chain link fencing is available in many heights and colors. You can order PVC slats pre-inserted by the manufacturer or after market installation. Slats come in 9 different colors and sliding and swinging gates are available to match. This is perfect for concealing dumpsters or storage lots where privacy is desired. The PVC Privacy Slats are an item that is either sold before or after market to provide privacy. Choose Hohulin for Your Privacy Fencing! Contact us online or call us at 309-316-1008 for your privacy fencing today! For other commercial fencing products, please visit the following pages: Chain Link Fences & Athletic Fencing, Rental Panels and Ornamental Fencing.